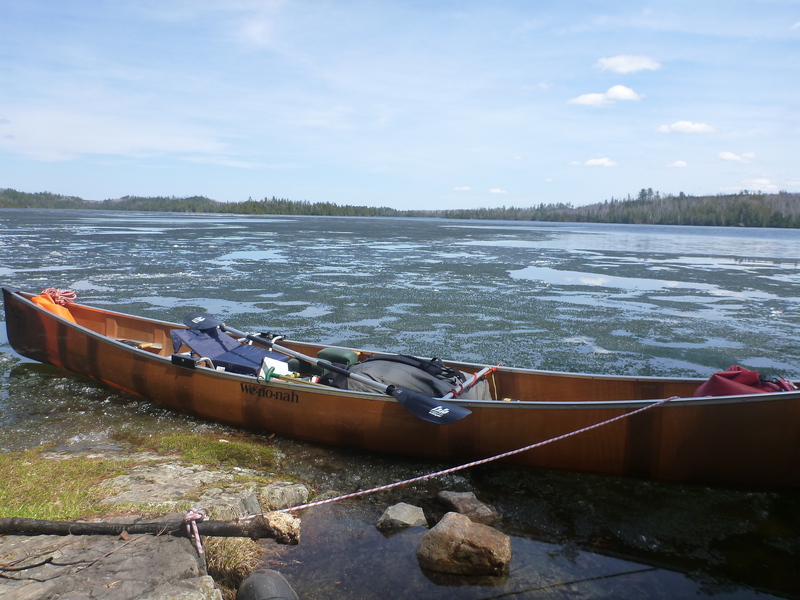 Trip Introduction: A first solo trip up Moose and through Knife Lake into the Man Chain of lakes in Quetico can be a wonderful trip to begin a summer paddling season. Moose lake chain leading north up to Newfound and Sucker are beautiful lakes to experience early in the season as well as Knife. I had never seen the Man Chain of lakes in Quetico. 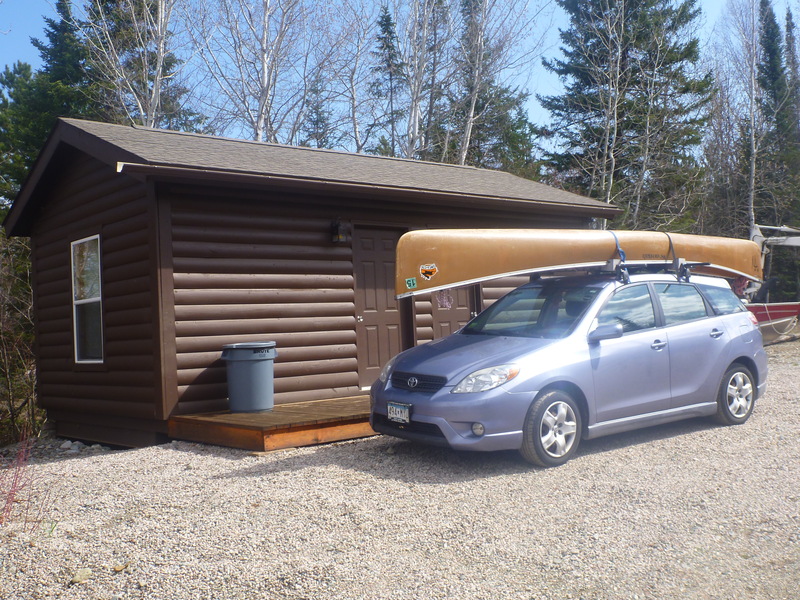 Fellow paddlers’ tales of fishing exploits and 5-star camp sites had enticed me all winter. 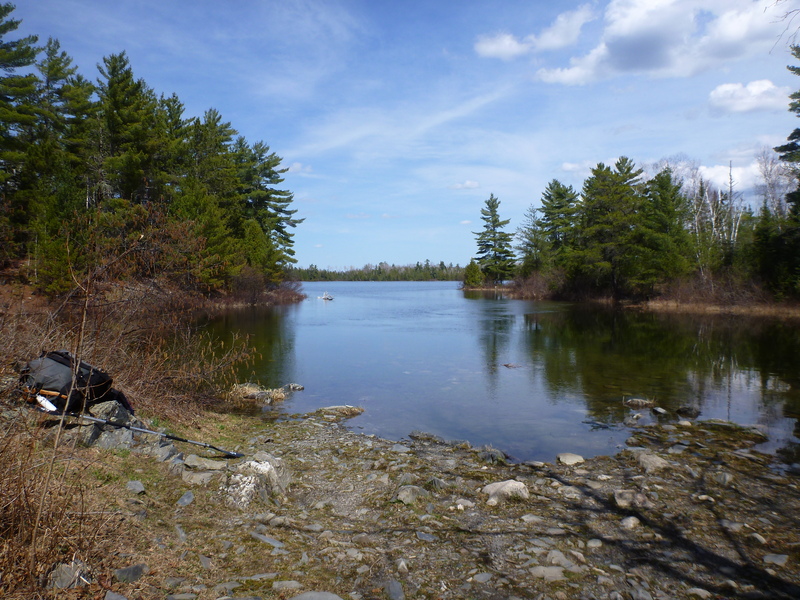 Tales of inviting, peaceful lakes with wonderful campsites and solitude seemed perfect. My decision to visit these lovely lakes in the BWCA and Quetico led me to contact Bob at LaTourell’s to book a tow up to Prairie Portage for May 11th. With the optimism that can only be borne from enduring a lengthy winter in anticipation of that first open-water paddle, I packed and headed north, ready for adventure. There is a cascading flood of emotion after a long winter where doing activities associated with warmer climes and being outdoors becomes overwhelming. I arrived with those thoughts and feelings at the outfitter just before supper on Saturday with the anticipation on going in, by tow the next morning, early if possible. 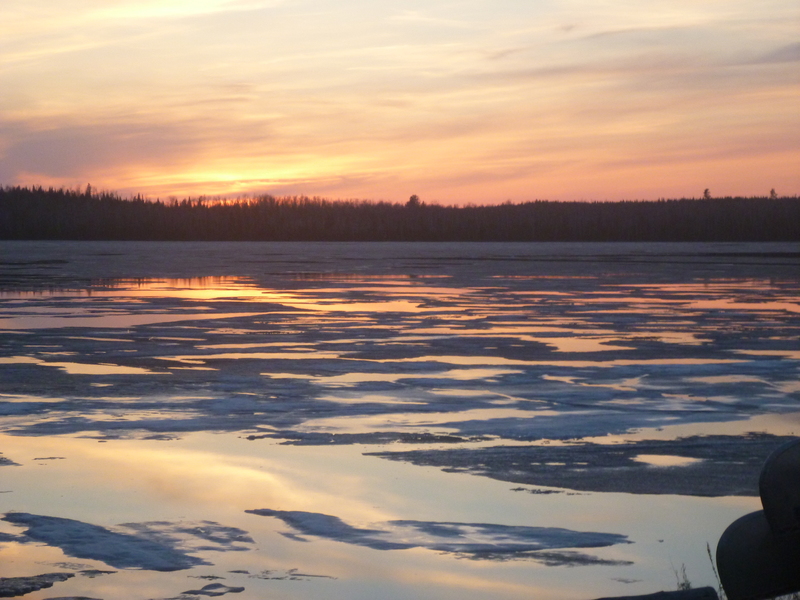 Sunset over Moose Lake ice. By TMI. All rights. The ice was pooling up and connecting into larger puddles when I arrived. Late Spring sun was providing scenic sunsets over the lake and retired to my cabin to sort my gear, study maps, and hope for the best in the morning. Bunkhouse at LaTourell’s: Waiting for Ice Out. TMI. All rights reserved. My next morning dawned bright and sunny with clear water in the southern end of the lake but ice flows still visible further north. I checked with Bob and realized we would all need some patience to see if today was the day. Finally a little before noon, he started shifting boats and people around and gave me the sign to load my gear at the dock along with my boat. We were finally going up lake! Bob’s crew consisted of a husband-and-wife team (his daughter and son-in-law) who piled into the tow boat in gumboots and heavy jackets after loading my beastly portage pack (I over-packed as usual for my first trip) and carefully strapped my canoe onto the rails above. We set out for what would be quite the adventure. The plan was to tow me up through Moose through the lovely chain of connecting lakes Newfound and Sucker all the way to Prairie Portage. They were opening up their cabins and operations at the portage on the US-side which gave me the chance to register for what I had hoped would be several nights on the Man Chains in Quetico as part of my shake-out trip. What we knew was that several strata of popcorn ice sheets lay across Moose Lake, running east-to-west and that we could navigate around and through them to open water clear up to Prairie Portage. Forest Service had flown over the lakes early that morning and relayed the intel so off we went. What we didn’t know was that 2 large strata of this deteriorating ice had drifted south and were completely blocking our way! My team swung our towboat around the back side of the island (pictured above in middle photo) and we proceeded to punch our way through to the next width of open water. I breathed a sigh of relief but not for long. Blocked by yet another ice flow, our pilot swung the boat around behind an island on the western shore of Moose, hoping to find a passage north. I was beginning to feel like Henry Hudson searching for the great Northwest passage in the services of what would eventually become the Dutch West Indies Company. Fortunately for me, I didn’t have to bail out and camp on Moose. 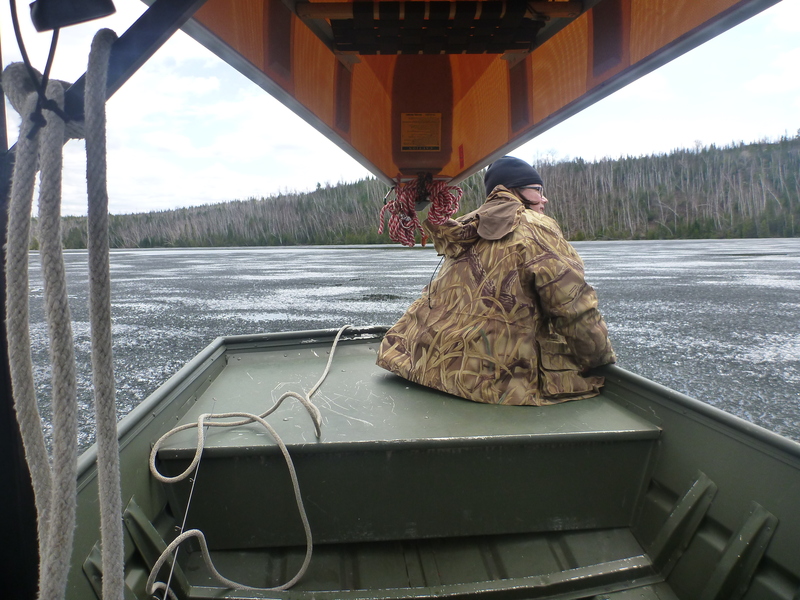 We eventually picked, punched, poked and ran our boat through to open water at the northern end of Moose and were soon speeding up the lake to Sucker. As we dodged the pine -studded islands of Sucker I knew I was on my way to Prairie Portage. 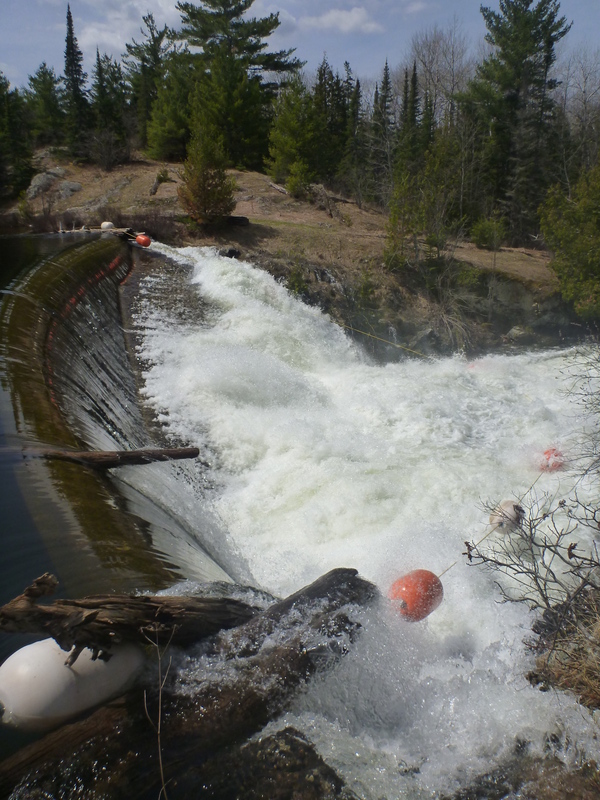 We carefully landed my boat and gear on the Canadian side of Basswood Falls which was roaring from melting Spring flows. I explored the rangers’ station which was still closed, self-registered and soon was off, paddling up narrow channels to Birch lake. More ice thwarted me at a couple of turns and I had to beach on one campsite to get a late breakfast and figure out a strategy but I was soon paddling again in the beautiful warm sunshine, wind-free to my first of 4 portages up the Knife river. Finishing my last exhausting carry towards late afternoon, The Knife Portage, I shoved off against a strong current threatening to sweep me back over the rock-strewn rapids and riffle. As I paddled out into Knife Lake, I knew I needed a campsite and water soon to rehydrate. What I saw took my breath away. Out on the horizon a cluster of islands lay ahead surrounded by what appeared to be floating shelves of steely, dark-blue water. But something was wrong as the water did not undulate or stir and then I realized I was gazing out over a completely frozen Knife Lake. Yikes! Fortunately for me, a channel was opened to the one and only island with campsites through a torturous path of white and dark ice flows, studded with popcorn-like shards. Carefully navigating the frigid waters, I landed on Robbins, exhausted, thirsty, and famished. Making camp, I finished camp chores and took some photos before flopping in my tent for an early bed. I was all alone in the BWCA and I had an entire lake to myself. At least for one night. A gusting wind and blowing rain all night and a pitter-patter on the tent told me to stay inside my sleeping bag for a while. A rainy day and I was trapped by ice surrounding my island camp. I snoozed for an extra hour or two, woke, read, snooze more and tried to let my body recover from the first day. By mid-afternoon I finally braved the elements by climbing out of my tent. The wind had partially blown the ice from in front of my site and I could begin to make out a path back down river to the portage. Making a quick pot of coffee, I sipped the hot elixir and nibbled some breakfast at 3 in the afternoon while monitoring ice movements out on the lake. Around 5 or so, another group of two tandems paddled up from the portage and grabbed the other site on the island. I could hear their laboring and clanking of paddles as the rain had picked up again. I strung up a line and cast a few times off the island to test my luck but the dark water was too frigid for any fish to be active. Gathering my maps and checking my canoe and gear, I dove back into my tent for an early bedtime. Tomorrow might be better. Too restless to remain, I packed up after breakfast this morning. Paddling away I was determined to make at least Crawford so that I could loop out through Quetico on my way home to Moose and my tow. I had given up on the Man Chain and Knife as I had lost any time advantage that I had gained. Noting the small patches of ice and snow in the bays, I found and tackled the portage to Crawford but checking my gear I realized that I was missing my MSR water filter bladder! I made this discovery after I landed, unpacked my boat and was ready to start loading up. Forty-five hard-fought minutes later I was again back at my campsite to pick up the water bladder right where I had left it when I loaded my canoe. Now the rain had begun and I was getting cold. I launched but was quickly driven to the rocky shoreline on the island, only a few hundred yards up from where I had just departed. Cold driving rain and a bit of sleet. Finally regaining the portage, I lugged first boat and then gear over the un-cleared portage which scales a 15ft rock face about 10 rods in and then descends down a muddy slope with plenty of bent poplars to hang up your canoe and grab at your pack. Arriving at Crawford around 11AM, the wind was now cranking in full force and piling up at my end of the lake. Putting in was a challenge and I soon found myself grabbing branches, hand over hand pulling myself and the boat forward through 15 – 20 mph winds with 25 – 30 mph gusts. I found the one and maybe only campsite and was able to spread out quite nicely on the pine-needle covered forest floor with towering pines swaying overhead. While I dried out gear, I cast a few times but my efforts yielded little. Sunset was a gorgeous array of reds and pinks and magically at 8PM exactly, the wind machine switched off and the winds skidded to a stop except for the occasional whisper. The next morning I rose around 5:30, fixed a cold breakfast and immediately packed and loaded to launch by 7AM. The winds had started to chug to life around 4:30AM that morning but I couldn’t climb out until later. Now I need to make a bit of effort to get down this condensed, scenic lake to the portage into Carp for my journey home. Winds posed a bit of problem for my Champlain and I had to trim it with a 50-gal. dry bag of water however I made the portage at the lip of the beaver dam and carried easily over to Carp on a well-used, mostly flat trail into a secluded bay. Paddling south down Carp was scenic in its own right and the weather seemed to hold as I watched the pewter-grey skies. But my luck ran out as weather broke about mid-morning when I was halfway down the lake. Rain, then sleet, then snow and maybe a bit of hail changeover pelted me. After another hour or so of paddling I made the International Border and the body of water with a portage that w ould take me into Birch, heading further west to Indian Portage and the pathway into Moose. Wind was picking up out of the west but not as strong as yesterday. Bucking these headwinds I pushed into Birch staying to the southern shore. Finally close to noon, I spotted the little bay that shelters Indian Portage and I pushed hard to reach it. More paddlers, groups of as many as 8 were heading east into Knife, and it was time to leave. My tow from LaTourell’s showed up a bit early with another crew to drop off. By 2PM I was loaded and heading south to Moose Lake, a shower, clean clothes and something hot to drink!